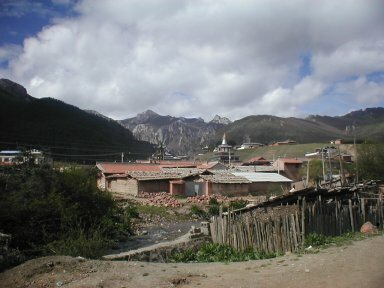 On the bus from Zoige to Langmusi, I met a girl who for all the world looked Han Chinese, but turned out to be Tibetan. She had reasonable English, and was well turned out in the fashionable way that city Chinese are. She was an accountant in a government-run Tibetan medicine hospital in Zoige, on the way to visit a friend for the day, it being a Sunday. Two interesting things. Her first language was the Amdo dialect of Tibetan, but she was only taught to read and write in Chinese at school. Now, in her mid 20s, she was finally starting to learn the Tibetan alphabet. Secondly, she got a text message (seemingly, the worst bus routes have the best mobile phone masts, it makes coverage on English railways look pathetic) from the Tibetan friend she was visiting. He asked “Where are you?”, in English. This because you can’t write in Tibetan letters on a mobile phone, and she couldn’t have read it anyway. He didn’t know any Chinese characters, so they had to communicate in English. He was another Tibetan educated in India. I haven’t got a number on this, but lots of them leave as teenagers over the mountains. There the Tibetan government in exile give them free education, and they return in their early 20s, embued with Tibetan culture. For this reason – more contact with English speaking foreigners – Tibetans seem to have much better English than Chinese. The other foreigners who had been on the broken down bus the day before also got off at Langmusi (photo). It’s a town of just 3000 people, I think half of whom are monks in the two monastries there. The monastries were run down, disappointing places. Perhaps underfunded, but also just unclean. I wondered round hopelessly in the morning, at lunch was approached in the cafe by an English speaking Tibetan guide, who I hired in the afternoon. And there I was, thinking it was Mark who had got himself the junket touring the world studying Tibetan! Or is the universe just geared towards giving your house unusually fascinating post-holiday conversations? I do feel that I went to Tibet accidentally. I hadn’t realised before I went that the ethnically Tibetan parts of Sichuan and Gansu really are Tibet. I think it’ll be another few months before I’m confident enough to just say “I’ve been to Tibet”, without feeling like I’m not telling the truth because I haven’t been to the Tibetan Autonomous Region (roughly, Ãœ-Tsang/Lhasa province).